More recently, the Bureau has been claiming that it had to change the temperatures at Rutherglen because they were different from temperatures at near-by locations. Of course, a real scientist wouldn’t tamper with data because it showed an unusual trend. Rather the unusual result might be investigated. But not the Bureau. It changes the trend at Rutherglen so it matches neighboring stations, but only after first changing the trend at neighboring stations so it matches the global warming trend. In protest I’ve sent an email to the CEO, Vicki Middleton. I am writing to request that you correct a Bureau of Meteorology fact sheet*, which shows remodelled (homogenized) data for Wagga, Deniliquin and Kerang with actual physical temperature measurements (raw data) for Rutherglen. Several members of the public, seeking clarification regarding adjustments to the temperature record for Rutherglen, have been advised by you in recent correspondence that the adjustments at Rutherglen are necessary to make temperature trends at Rutherglen more consistent with neighboring sites. In particular, you have directed them to this fact sheet* that shows minimum temperatures at Rutherglen cooling, while temperatures at Wagga, Deniliquin and Kerang are warming. What you have failed to point out, however, is that the Wagga, Deniliquin and Kerang series represent homogenized time series. That is, the data have been substantially remodelled. I have plotted the raw temperature series for three Deniliquin locations below, including the data from Wilkinson Street from 1913, which is when the Rutherglen series begins. The top green squiggly line represents data from Wilkinson Street, Deniliquin, the short purple squiggle is data from the airport at Deniliquin, and the mustard-colored squiggle is from a site referred to as Falkiner Memorial, Deniliquin. Also shown in this chart are both homogenized and raw data for Rutherglen, as the red and blue squiggly lines, respectively. The three dotted-lines represent the linear trends from Wilkinson Street (green), the raw (blue) series for Rutherglen, and the homogenized (red) series for Rutherglen. 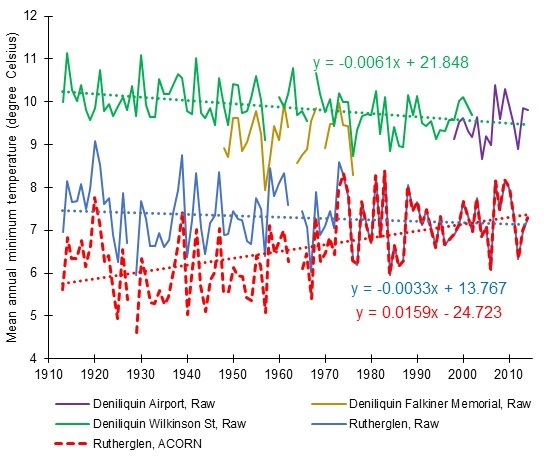 The cooling trend in the Wilkinson Street, Deniliquin series of 0.6 degree Celsius per century is statistically significant (p<0.05). I appreciate that you may have been misled by your employees into believing that the cooling trend at Rutherglen (represented by the blue line in the above chart) is erroneous. This is not the case. I recognize that this cooling trend evident in the minimum temperature record for much of the twentieth century at many rural locations in south eastern Australia is inconsistent with official Australian and also global trends. Nevertheless, it does appear to be real, and is statistically significant for some locations. Of course, real scientists are concerned with the interpretation of real data, rather than remodeling to generate constructs that fit popular political agendas. Copy Maurice Newman, chairman of the Prime Minister’s Business Advisory Council. This entry was posted on August 13, 2015 at 11:56 am and is filed under Alarmism, Australia, Climate, Fraud. You can follow any responses to this entry through the RSS 2.0 feed. Both comments and pings are currently closed.